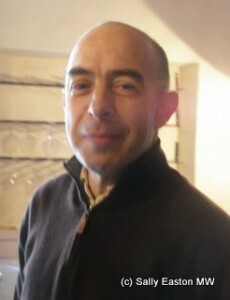 Sylvain Fadat, of Domaine d’Aupilhac, is a pioneer of Monpeyroux, one of the top Languedoc locations for making wine. The areas nestles in the lower slopes of the 848m peak of Mont Saint-Baudile in the Cévennes foothills. He established his domaine in 1989, after five generations of grape growing. Montpeyroux is one of the erstwhile ‘crus’ of Languedoc, and along with the likes of La Clape, Pic St. Loup, Terrasses du Larzac, and Picpoul de Pinet, can append the name of the village to its Coteaux du Languedoc appellation. Wines are a blend of grenache, mourvèdre and syrah, with cinsault and carignan also allowed. It has become a dynamic zone, with around 20 producers, including the co-operative, tending some 500 diffuse hectares. 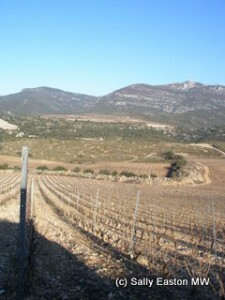 Fadat has made something of a specialty of carignan. He said “we were the first to produce a pure carignan in Montpeyroux. I’ve produced a pure carignan since 1989. I know it can produce incredible wine with finesse, balance and good acidity. 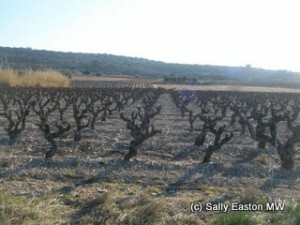 Carignan mostly keeps good acidity even if the summer is hot. ” He makes a point with his pure carignan too. It’s made without any oak because “I don’t want people to say my carignan is good because it sees good new oak.” It is not made using carbonic maceration. He said “carignan can be good with a very traditional vinification and ageing in foudres –the antique method from a long time ago.” He even ages it in bottle “to prove the terroir of Montpeyroux can age.” It has to be labelled as a Vin de Pays/IGP. This north-facing amphitheatre of 12-13 year old vines limestone and basalt from a nearby volcano is the result of huge investment by Fadat, some €500,000 in total for 8.5ha of vineyard. There had been a fire in the region in 1995 which exposed the very rocky soils, and it was here that Fadat broke rock to start his new venture. 30% roussanne, 20% marsanne, 30% vermentino, 20% grenache blanc. 350m on north-west facing slopes, clay-chalk soil over basalt. Blended before fermentation and put to cask and barrel for ten months. Fresh, citrus, melon fruits. Lovely floral freshness, density and elegance. 100% carignan. 28 day maceration with battonage. In casks for 18 months. Dark brambly berries on the nose, has a chalky grip at the sides, then ripe dark cherries. Young and full-flavoured. Meaty, mushroom, steak nose, steak and forest floor palate. Smooth, richly textured and still very fruit-focused, dark berries, smooth and youthful really, despite some forest floor notes on the front palate. Softened into itself compared to the 2010 vintage. Really interesting and flavoursome. Good. Limestone terraces and blue marls. 15-30 day maceration with lees stirring. 20 months in small casks and barrels. Dark, muscley, fresh biltong, sweet-savoury edge, steak-like, and with stealth muscle. Nicely balanced, with 14% totally integrated. Some lovely layering and complexity here. Good. 30% grenache, 40% syrah, 30% mourvèdre. Grown at 350m on north-west facing slope, 15 months in barrel. Smooth, bright, ‘modern’ clean. (not that the others aren’t). Supple youthful fruit (young vines?) Lush and soft, plush and fresh, uncomplicated with nicely dense fruit. 40% mourvèdre, 40% syrah, 10% carignan, 10% grenache. Blend of the two terroirs, the clay-chalk of Aupilhac and the 350m altitude Cocalières on basalt sediment. Up to 15 days fermentation and maceration, in 700 litre barrels. Syrah from Cocalières with mourvèdre from Aupilhac. Whole bunch fermentation in open demi-muids with pigeage. Sweet red fruits on the nose, plushness and freshness, smooth and finely-grained texture. Nice dark, liquorice, muscularity, more toning than muscle really. Has plushness of youth with defined structure too. 40% carignan, 40% mourvèdre, 20% syrah. from 60 year old vines on chalk-clay soils and blue marls of Aupilhac. Whole bunches vinified in 700 litre barrels. Last produced in 2000. Spicy forest berries on the nose. Overt new oak, which is very fine grained. Tasty, concentrated, fresh, big wine, and very nicely proportioned. My research visit to Vinisud was sponsored by Sud de France. Lovely article. I even remember seeing the results (before and after) of the 1995 fire that led to the creation of the altitude vineyards. These days Sylvain makes diverse styles for all palates, but for me the Carignan and Montpeyroux remain favourites but I also like the elegance of the Les Cocalières wines. One point. For me Montpeyroux is Terrasses du Larzac (vinously it’s in the centre). They understandably just want to keep the village name on the label.